(Seattle,WA) – It’s safe to say that Space Dust, last summer’s Manic IPA offering, sent hoppy beer lovers into orbit with its delicious blend of Yakima Valley Citra and Amarillo hops. But like anything cyclical, Space Dust gave way to Valhalla, and then Savant and Dayglow in the celestial rotation of Seattle’s Elysian Brewing Company. Now Dusty the space hop is back, streaking across the sky beginning mid-August in 22-ounce bottles and on draft. Look for Space Dust’s ethereal lupuliciousness in stores, restaurants and taverns in all markets. In case you spent last summer on the dark side of one of Saturn’s moons, Space Dust is built on a simple grist of Northwest pale, C-15 Crystal and Dextri-pils malts, brewed to around 7% alcohol by volume. But it’s the hopping that cues the music of the spheres, topping out at 65 IBU. Chinook holds down the bittering and makes a flavor contribution as well, but then Amarillo and Citra reach escape velocity in three separate brewhouse additions, as well as a dry-hopping presence weighty as a dwarf star. 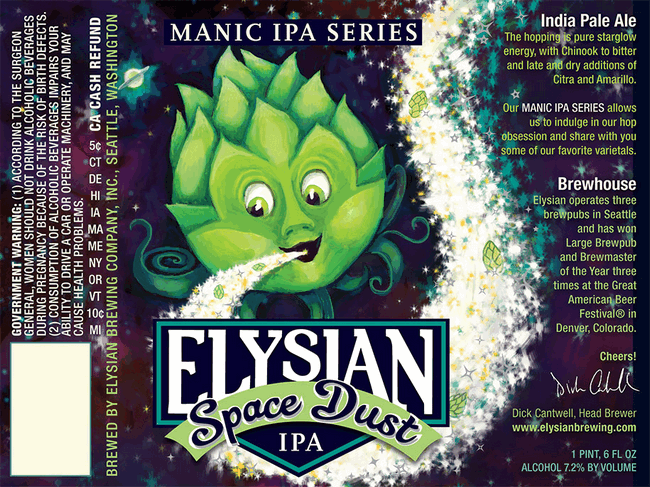 Look for Space Dust’s reentry later this summer wherever Elysian beer is sold.